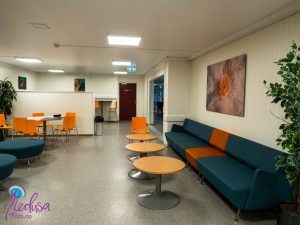 MedusaFoto had the pleasure of decorating the multi purpose sports hall in Hitra this year. 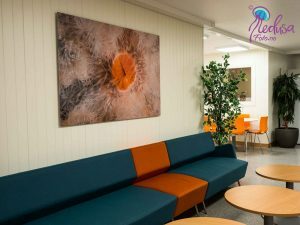 The lounge was given a considerable face lift, and I got the job of providing pictures to makes it even more cozy. 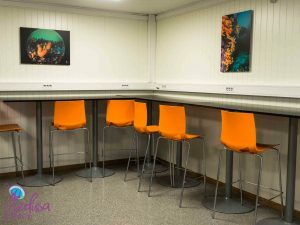 The CEO, Ann-Kristin Kjerringvåg Willmann, was determined to find pictures that matched the color scheme of the interior. 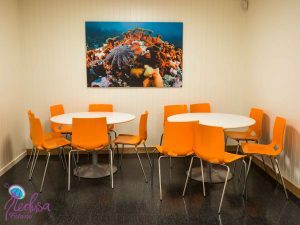 Luckily the ocean comes in blue tones, and the corals and plumose anemones in oranges so underwater pictures where chosen all over the place. 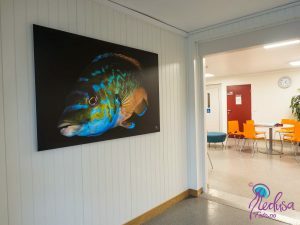 In the entrance what could possibly be the worlds largest cuckoo wrasse, 1 x 1.5 meters, is welcoming you – and from there on you step into a lounge area that is now delicately furnished with colors that lifts your spirit. Thank you for the job!